When it comes to losing weight, we often prefer the quickest of methods like pills, commercialized treatments and different kinds of fad dieting. Certainly, you will get results, but it will be for some time only, soon you will be back as these all are just the temporary methods of reducing weight. When we start to lose weight quickly our body oblige us by starting in mechanisms that will get back the lost weight very soon. So, it is advised to be patient and let your fat celluloid adjust to the new body size willingly. Apple cider vinegar is very helpful and perfect for gradually reducing weight. It is very efficient but gives a steady and controlled weight loss and not a quick fix. How Does Apple Cider Vinegar Works? Apple cider vinegar is a very age old ingredient that supports you to lose weight by kicking several physiological mechanisms. Here are the ways it works to reduce weight. 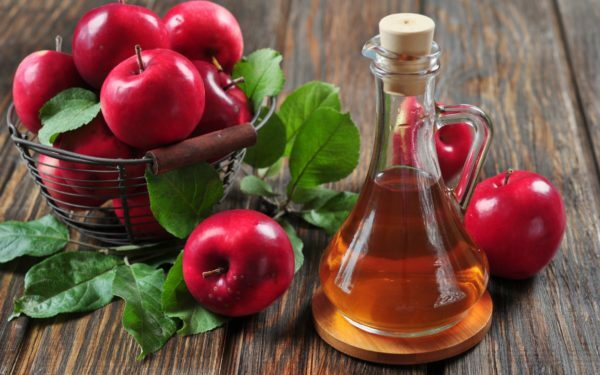 Apple cider vinegar should be consumed before taking meals, as the pectin that is present in ACV will make you feel filled up and will suppress your appetite. It will control your cravings for eating mid meals which is one of the primary reasons of weight gain. Consumption of Apple Cider Vinegar regulates insulin levels which control in return the sugar spikes of odd time eating. You can stick to your diet plans if unwanted cravings are not there to divert. Results are there to prove that when Apple cider vinegar is given to type 2 diabetes patients, 4% reduction in the fasting blood sugar has been detected. There are good and the bad bacteria, Probiotics are good bacteria and helps a lot in weight loss. They keep our body healthy by reducing inflammation and preventing obesity. Apple cider vinegar is an excellent Probiotic, as a result giving us a healthy body that supports in our weight loss regime. If your metabolism is not okay, then it can lead to an accumulation of unwanted fat and gaining of weight. Decreased metabolism can often result in fat accumulation and weight gain. There is an acid that is present in Apple cider vinegar that helps in improving metabolism as well as giving you a healthy digestion. If you are suffering from insomnia, then Apple cider vinegar along with honey is all you want. Not sleeping properly results into an increase of ghrelin in your body, it’s a hormone that stimulates cravings. Apple cider vinegar gives you better sleep which helps in regulating your stress and hunger hormones. Apple cider vinegar contains fiber that is suitable for absorbing toxins from your body which results in better bowel movement. It helps in balancing of pH level and regulates cardiovascular stimulation. Here are some quick Apple Cider Vinegar recipes you can quickly try. This will make you feel full by improving your digestion and resulting in having fewer calories and keeping you away from binge biting. Add 1– 2 teaspoons of apple cider vinegar into a cup of water. Rinse mouth thoroughly with baking soda and water to protect your teeth from acid. Take a bowl and add 1/2 cup of apple cider vinegar and olive oil, now add two finely chopped cloves of garlic, two spoon maple syrup, pepper and salt as per your taste. Mix all the ingredients properly and pour generously on your salad as dressing. Mix 1/4 cup of freshly chopped basil, oregano, 1/2 cup of olive oil and apple cider vinegar, and 1 – 2 tablespoons honey, pepper, and salt according to your taste. Mix all the ingredients properly and add generously to your salad. Take a bowl, add 1- 2 tablespoons of ginger,1-2 tablespoon of sesame seeds, two finely chopped cloves of garlic, 1/4 cup sesame oil,1-2 tablespoon of maple syrup and two tablespoons of apple cider vinegar, pepper and salt as per your taste. If you want to add taste and some more benefits along with it, then you can combine Apple cider vinegar with honey, lemon, cinnamon, maple syrup, garlic, cayenne pepper and ginger and customize according to your taste and choice. Apple cider vinegar should be diluted with water before consumption as its direct intake can lead to burning sensations in stomach and esophagus. Use raw and organic Apple cider vinegar which is unfiltered and unpasteurized for the best result. Usage of straw is recommended while consuming Apple cider vinegar as it is acidic in nature and can damage the tooth enamel. If you are a patient of osteoporosis, then avoid consuming Apple cider vinegar as its excess consumption can result into low potassium in the body that decreases bone density. If you are diabetic or using laxatives or a heart patient, then consult your doctor before consumption of Apple cider vinegar as it may give some negative result after interacting with that medication. Experts say that excess intake of Apple cider vinegar can increase the acid levels in the body that could damage the digestive system, so if you are a patient of gastroparesis, then you should take Apple cider vinegar after taking a diet full of nutrients and with caution. 1) Which brand of apple cider vinegar should I buy? You can buy any brand that gives raw, organic, unpasteurized and unfiltered one and should have mother element to it. 2) What is the best time to drink Apple cider vinegar? It can be taken any time of the day but the best is to consume it before the meals as it helps in digestion of food. 3) What is the appropriate amount of consumption? You should take 2-3 tablespoon ideally, do not exceed it as it may cause burning sensations in stomach and esophagus. 4) Is there any interaction of Apple cider vinegar with medication? Yes, it does, so if you are on any medication specifically diabetes or any heart-related medicine, then please consult your doctor before consumption. Finally, we would like to say that a raw, organic, unfiltered and unpasteurized Apple Cider Vinegar is best for losing weight. It is not a very quick but a steady remedy. It has numerous health benefits. So, we wish you luck in starting this new journey of weight loss.